By successfully converting someone as important to his people as Sachem “Wasamapah” , the goal of the Moravian missions was reached–planting the hidden seed. The symbolism of course had an obvious line of reasoning–as inferred from the Bible, this small grain-sized seed of mustard ultimately became a large fully grown living object. For Wasamapah, this took place not only at a personal level, but also at a much larger social and societal level. As the new method of thinking was spread in all directions, much like this symbol of the single seed and plant of mustard was now reseeding itself across an open field. What resulted was the propagation of numerous new generations of followers, each with numerous branches spread across and re-seeding themselves in every direction possible. This symbolic image of the Moravian missions was first defined by Zinzendorf when he was still a child, when he used this image to define his first group of devoted followers, a young gang of sorts common to a boyhood saturated by Christenhood. This piece of the Moravian philosophy became the primary cause for his later mission in life, and was how and why he was able to convince members of Royalty and some sisters residing in a castle in Moravia to support his cause and fund his travels to the New World, his goal–to convert its most wild and hedonist of people. When we compare Moravia with Shekomeko, its mountainous terrain with deep bluish green conifer forest, we can understand how the symbolism of the place meant everything to the people like Christian Henry Rauch who learned under Count Zinzendorf in Moravia. When missionaries like Rauch and others made their way into these hinterlands, they had to be interpreting their location and the symbolism of the way the environment looked as God’s indicators to them they were on the right path. The Jesuits just a little north of this area had pretty much done the same, interpreting the trilobal, triform leaves of Sassafras as a natural theological sign of divinty. The Moravian Missions like Rauch probably saw the same in these and other plants of the wilderness. With trees yet to be felled, bark houses yet to be built, wilderness forests in need of conversion to Moravian versions of the farms and fields of the Garden of Eden, the limits of imagination becam Rauch;s only limits to waht he was about to accomplish with these Native Americas. What better place to plant such the Moravian seed placed in his mind by Count Zinzendorf, Rauch must have thought, than in previously unsettled country like that of Shekomeko? Very much in touch with the Moravian ideology was the belief that the best way to propagate this seed was by travelling along rivers and streams, tagging the shoresline of the many lakes in these wilderness settings. As the missions and their young neophytes followed these routes through the wilderness, they were able make their way to other tribal settings and produce what many considered to be “new crops.” These events have been considered the cause of an even greater degree of outdoor missionary work that occured in Upstate New York during the decades that followed. The new camp meetingsgave rise to a meaningful and lengthy history of a part of New York where the many missions passing through led that part of New York to be called the Burned Over district. It was during some of the earliest years of the establishment of practices in the Burned Over district that Cooper’s work had the greatest impact upon local communities, and the impacts of the Moravian’s influences and Mahican fate that followed once they came to finally settle in Ohio and spend their final years on this earth, thateven though the people died, the purpose of the Tschoop’s missions continued to move forward by influencing many other people. With the Moravian Christian Indians no longer a local problem for Shekomeko, their initial cause could have disappeared, but instead it began to have impacts outside of the immediate Shekomeko region. The Outdoor Revival tents that continued for decades to come are direct consequence of this Shekomeko experience. They are symbolized more than by just the Algonkin, Mahican and Delaware Indians along these various rivers leading from Tschoop’s homeland, through the Catskills, to Bethlehem, Pennsylvania. There was a certain amount of respect Tschoop experienced due to his transformation. This respect came by way of the traditional communications routes taking place in the Mahican village. According to Loskiel, this respect began fairly early in this story, when Tschoop looked at Rauch worn out and tired from his travels by foot as a missionary. Rauch was not just working on the Mahicans residing in Shekomeko, there were other locations that he had learned about that had to be included in his missionary work as well. According the Loskiel’s map, to the east there were two fairly closely located settlements in Sicham (on Indian Lake, which Loskiel does not indicate on the map as an active mission, although his story tells us otherwise), Pachgatgoch (near Kent), and Wachquatnack. To the north, a smaller settlement that we do not hear much about was also on Rauch’s list, Potatik, up near what is now the Connecticut-Massachusetts border. To the south there was Wachquatnack. Because it was the closest place in this cluster or missionary settings, the communication between Shekomeko and Bethlehem was most important to the continuation of these efforts. Shekomeko served as a way point for travels taken from the sites in Connecticut, to the area in and around Kingston where some members of a small group still residing in this part of New York, the “Sopus” (Esopus), were successfully converted. 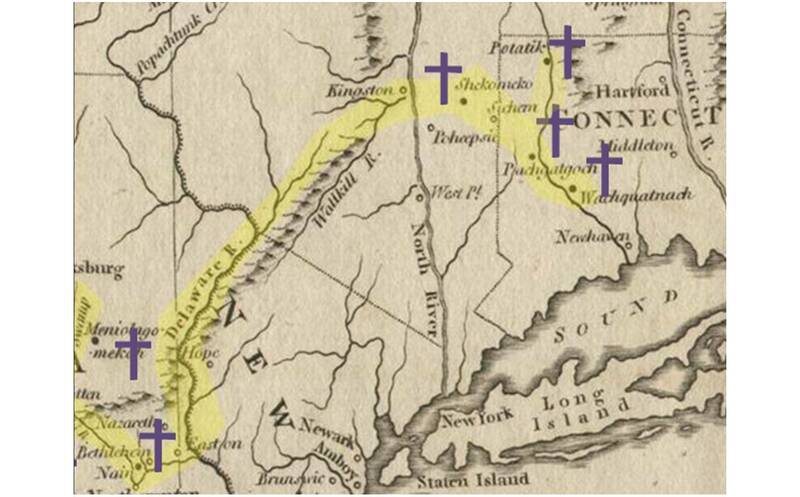 From the Esopus site, these travellers could make their way southwest along the branches of the Delaware River leading from the western face of the Catskills towards Easton and then finally Bethlehem. This fairly close association enabled more than sufficient communications be maintained between Rauch and his assistants and the main Moravian missionary leaders in Bethlehem. There is one other lesson here. We often forget the reason we initiated something that we do normally as a part of our lives. We forget the first person who first taught us to walk ( we intuitively know and think we remember). We forget whatever we said at an interview that landed us out first job. We usually forget where we bought our first pair of shoes. We tend to not forget those events that have strong emotional attachments to them, like the first date or kiss, the first time we hit the ball out of the park, the first time we owned our first car. Remembering where and when we were when we became devoted to some social cause can sometimes fall into much the same type of category. If the initiator of some sort of event is not that inspiring, we tend to have an amnesia about that particular event. But when the initiator is awe-inspiring, we know who it was that changed our mind and where it was that this even took place. Indirect communication routes have the same impacts on people. People who become aware of a cause and who do not know the initiator of that cause, provide us with an excellent example of the best kind of social influence and change that a third party individual can have. Once stage 2 is reached in an interpretation of how someone causes social change, the immediate, local impact and change, and this lesson begins to travel its own route to other places, stage 3 is about to be reached. Suddenly the first generation of thinkers are less known, in exchange for the cause now becoming the focus of these communications. With stage 3–the route to much larger area of change are being pursued. This perpetuating history of the Moravian Missions and it history will go much further west than just Ohio. Its spread to other regions about the United States exemplifies the considerable degree of success Tschoop’s life mission has had on people in general, not just the Shekomeko Mahicans and their neighboring Christian Indian partners.